Welcome to Garden Bloggers' Bloom Day for April 2018. Here in my USDA Hardiness Zone 6a-ish garden in central Indiana, there are lots of blooms to share on a rainy weekend. And a few buds, too. But there aren't as many blooms this year as last year. I checked. And then I checked two years ago. We are still behind this year compared to that year. Same with three years ago. Yes, indeed. After a few warm days at the end of February, March was miserable and April hasn't been much better so dear sweet Spring with all her pretty flowers is taking her sweet time in arriving. That's fine. There are still plenty of flowers to enjoy and more to come! First up is a planting area around the crabapple tree in the front garden. It's filling up with daffodils and grape hyacinths with a few Siberian squills still blooming. I see foliage, too, from the heucheras, columbine, a few tulips, and winter aconites that have finished blooming. In another few days, the crabapple tree will be in full bloom and then whoosh, there will be a lovely flower petal fall that will blanket the flowers below. It's a garden fairy's paradise. Really, truly, spring is garden fairy time. Every bloom looks like it was made for the garden fairies or made by the garden fairies. Here's a quick rundown of a few such blooms in my garden, in no particular order. 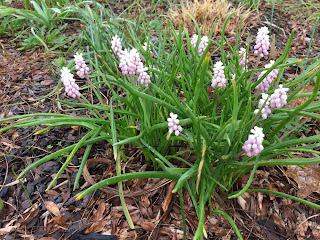 Out in the back, I have pink grape hyacinths in bloom in the border I call Bird's Blanket. Nearby in another garden border, these little white flowers make a tiny puddle of blooms every spring. I rescued them a long time ago from a wooded area that was being dammed up to create a lake. I am pleased they find my garden to their liking and return each spring. I think they are rue anemone, Thalictrum thalictroides. Oh so close to blooming this weekend! Trout lilies, Erythronium americanum, are budded up and will probably be in full flower on the 16th after all the rain we are getting over the weekend. I like that they are self-sowing a bit! More daffodils. For someone who professes not to be that fond of daffodils, I seem to have quite a few. I have star flowers, Ipheion, too. They are spreading out, which is good and makes me happy. 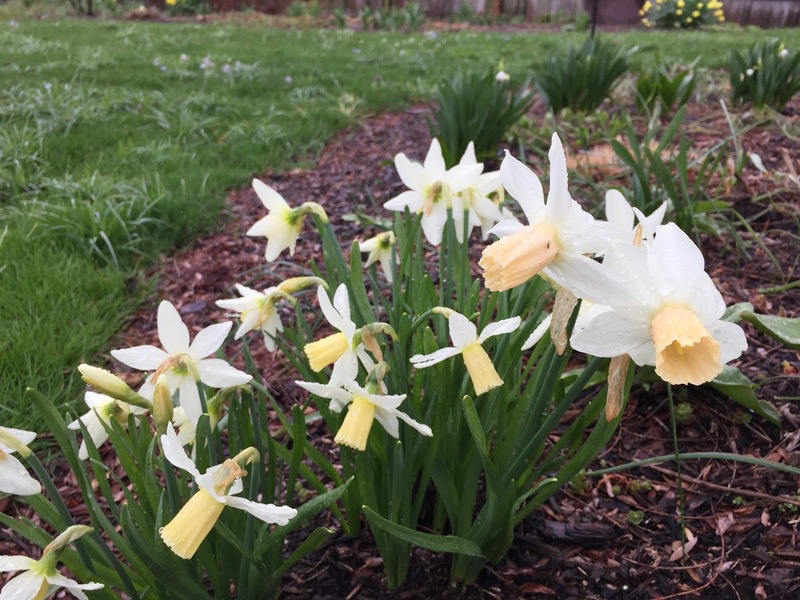 I call these tiny narcissus jonquils, instead of tiny daffodils. Ignore the weeds. I do! It was a rough spring for the star magnolia, Magnolia stellata. But it still has some decent flowers. How about these flowers, called Fairy Wings. You may know them as Epimedium. And almost joining in for bloom day is my favorite tulip, Tulipa sylvestris, which goes by the common name Woodland Tulips. There are other blooms here and there, but that's enough to give you an idea that spring is finally coming to my garden! What's blooming in your garden? We'd love to have you join us for Garden Bloggers' Bloom Day and share what you have blooming on or about the 15th of every month. It's easy to participate. Just post on your blog about your blooms then leave a comment below to tell us what you have and a link in the Mr. Linky Widget so we know how to get there. Hi Carol. The spring season does seem to be getting later and later over the past few years. We had our last snowstorm on April 2nd. and the blooms are delayed, but finally starting. We seem to be on the same schedule so it is nice to see that you are finally experiencing some blooms after this long awaited spring . Happy Bloom Day and happy Spring...finally! You have such a great variety of bulbs. I really need to plant more but always seem to forget. We're about a month behind here too. I love your comment about weeds - it's the best attitude to have! Your garden looks as wonderful as ever! Lovely to be back with a Blooms Day post again :) Your first daffodil photo looks like 'Salome'? Mine are also in bloom, though I chose 'Talia' for today's post instead. Their scent is wonderful. I have a love hate relationship with daffodils too. The little ones I do love. Or something that is a bit different from the norm. Happy Spring Carol, what a wonderful time of year it is! Your garden now comes to a big life! In a little while it will be covered with all colors. I can say my garden is behind the past 7 years for sure. I am trying to be patient. This weather sure makes me happy for each and every bloom that dares to show itself. Everything here in southeast Michigan is now coated in ice. Double ugh! The good news about this morning is that we don't have the ice that is just a few miles away. The bad news - not much blooming here in the Southern Tier of New York. I hope the mild weather of the last couple of days "goosed" things along, because we are now back to winter. But you are still ahead of us here, and it was a pleasure to read your posting. (Not sure if the "rue anemone" is bloodroot, but I'm not a great wildflower identifier). The daffodils I planted last Fall are blooming. Yay! Sorry about your late spring. I talked with Mother Nature about fixing it for you but she just muttered something mean about Father Time and Jack Frost and left in a huff. (Do the garden fairies get too cold to work above ground when it's freezing?) Despite the cold, you still have beautiful blooms this month. Beautiful spring ephemerals heralding more floriferous months to come. Thanks again for hosting and happy GBBD! Tulipa sylvestris has become my favorite as well. Happy Bloom day ! So pleased to be back with something to share! 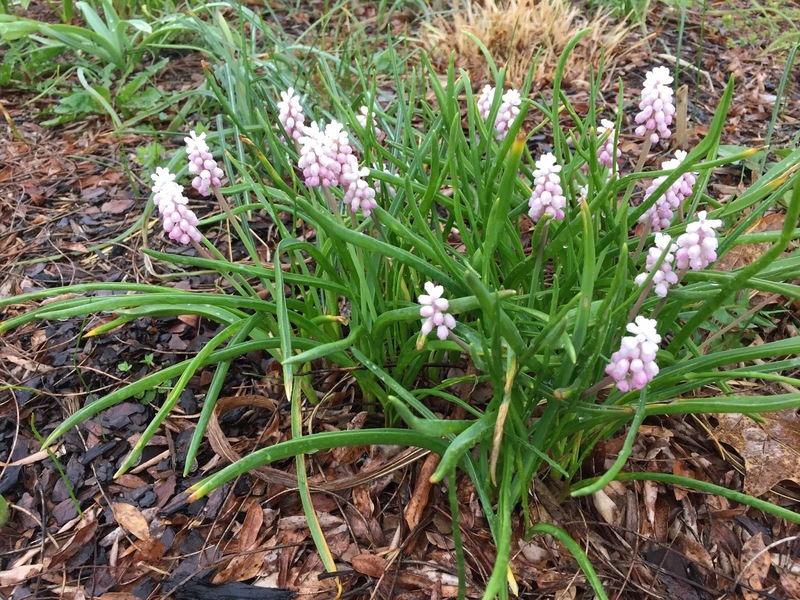 Love your pink grape hyacinths - never seen those before. Am waiting for my first blue ones to bloom - will certainly have to keep an eye out for pink ones. I'm glad spring has finally reached you, even if she is still wearing long-johns. While spring was late in your area, she's already being pushed out of the way by summer in mine and blooms are lighter here due to winter's miserly touch with rain. Thanks, as always, for hosting, Carol. Worst April here in quite a few years. Am jealous of your lovely spring blooms. We too have weather that can't make up its mind, but at last I think spring is with us and winter fading away. Love all your colourful flowers, I wish I could grow tulips like you, they don't like my soil! Carol, your flowers are beautiful! Daffodils and tulips are up in South Dakota but not in bloom at Plant Exchange. Your idea of looking back to past years for what was in bloom is a good one. When I scroll my plant photos by month, the pattern of bloom time is similiar, even with a slow start spring as we are having. Plants are amazing in their adaptations to weather! Happy Spring, Carol! Gosh, it feels good to finally have something blooming to share. This winter has seemed to last forever. I am not convinced spring is really here though because the temperature will drop tonight to 35 (F). here in Vienna it has been very cold in March and I thought that everything would be behind this year. However, in the last few days the garden really seemed to have caught up. Whereas two weeks ago everything seemed grey and dull, everything seems green and vigorous by now. When I went to my garden after work today it was already dark, so I could´t take any pictures. However, I took some pictures a few days ago. It is surprising how much the garden has changed even in the few days since I took the pictures. In only two days time so many flowers have opened their buds. It´s really amazing. Spring has been late this year, and it's making me crabby. But I realize we have been spoiled the past few years. Especially last year, when most of my tulips were blooming by mid-April. 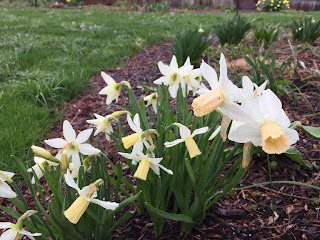 This year, I have just a few blooms right now, including the first daffodils. Oh well, I'd rather enjoy them all when it's a little warmer anyway. You do have quite a few spring lovelies, in spite of this chilly weather! Your wonderful collection of bulbs help bring on spring in a nice progression. Love the little Anemone and the story behind it. Look forward to meeting you in Austin in a few weeks! That magnolia is just beautiful! I grew up in the northeast and I miss all those sweet spring bulb blooms! Enjoy. This is my first link to this blog, so I hope I did it correctly. This is the article I posted: https://tonytomeo.wordpress.com/2018/04/15/garden-bloggers-bloom-day-april-15-my-first/. I feel the same about daffodils, but I often feel guilty! Poor things. Overshadowed by the attention-grabbing tulips. Hello, Would love to join your Bloom Day group if I may. Love the Erythroniums - I grow 'Pagoda" and E. revolutum. Here's to Spring! Cheers all. I'm a day late, hope you'll forgive me. Here's to spring! You always have so many wonderful bulbs! We have had such wet and cold weather that many of our blooms are late or lasting awhile when they do bloom. My Ribes sanguineum has been blooming for a month! I'm a little late, but spring is a little late around here, so I'm in good company! Happy GBBD Carol, and thanks for inspiring me to go capture photos of the wonderful hellebores blooming in my garden right now. I was going to profile all the flowers I have in bloom at this very early season, but I had too much to say, so decided to make a whole series of posts. The first one is about winter aconites. Fortunately, I have lots of early spring bloomers - I love when the candytuft flowers arrive. They make my garden sparkle so! You have a wonderful collection of bulbs. I lost a few tulips to some deer but I have plenty other bulbs flowering so it's okay.